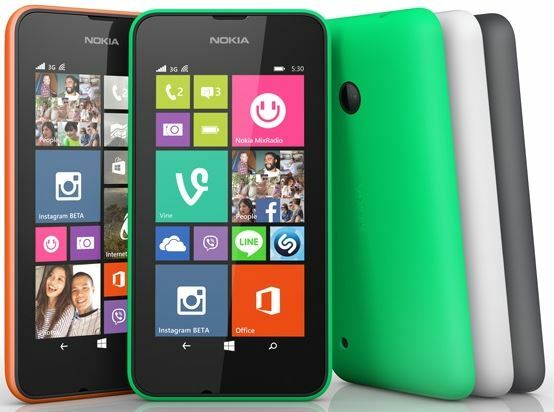 Lumia 530 the latest smartphone from Microsoft is the recent launch by Nokia which is based on Windows 8.1, there were two versions of the device released Lumia 530 and Lumia 530 Dual SIM. Microsoft is planning to target the budget smartphones market with this device in which many new companies are coming up with high specifications like the Moto E and Asus Zenfone etc. The device is being priced at Rs. 6900 approximately after conversion of the price EUR 85 which was announced by the company. The devices will be available in the retail market in August not all over the world but only in some places. Lumia 530 runs on Windows 8.1 with Lumia Cyan update and support firmware over the air updates. It has a 4 inch LCD display with a resolution of 480×854 pixels. having pixel density of 246 ppi. the device has a 5 megapixel rear camera and no front camera. The device is powered by a 1.2 GHz quad core Qualcomm Snapdragon 200 with 512MB of RAM. It has 4 GB of inbuilt storage and expandable upto 128 GB using microSD card. It weighs just 128 grams and measures 119.7×62.3×11.7mm.It supports GPRS/EDGE, 3G and WiFi along with Bluetooth 4.0 and GPS. Both the normal and the Dual Sim version of the phone are similar in all specifications except for the extra sim capability of the dual sim version. Both the devices support Micro SIM. Both the devices have a 1430mAh battery which the company says will give 10 hours of talktime and 528 hours of standby time. It has a micro USB port for charging and data transfer. Microsoft is trying to get smartphones in the hands of everyone by coming up with this budget smartphone but in the same price range there are many other companies which are giving devices with much higher specifications and mainly better display which is where the device pricing is decided. So lets see how Nokia 530 fares in the market and whether it will be able to get success as a budget smartphone. How to trace stolen Nokia Lumia 530 through IMEI Number.Please let me know as i have lost my new Phone.